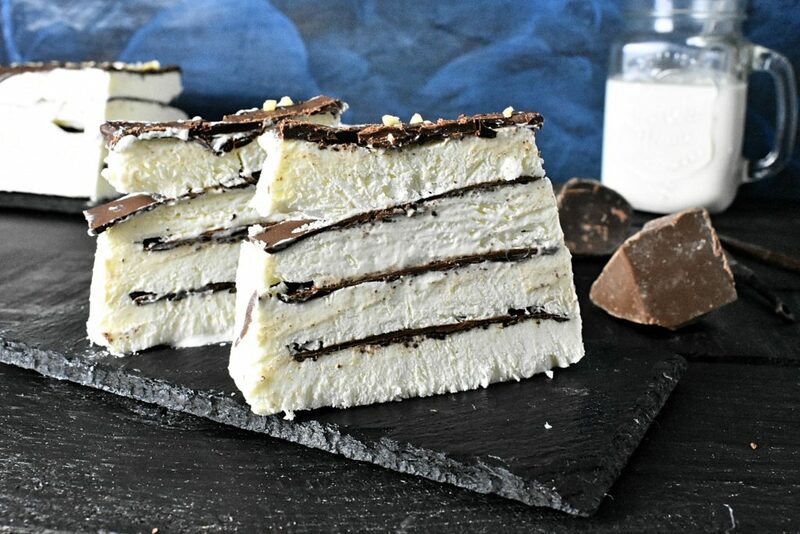 The 80’s born Viennetta unites the smooth vanilla and the strong dark chocolate making it a timeless summer hit and a perfect companion for Dirty Dancing. We’ve been missing this taste since we are on low sugar, no sugar diet so this summer we decided to make sugar free ice cream. 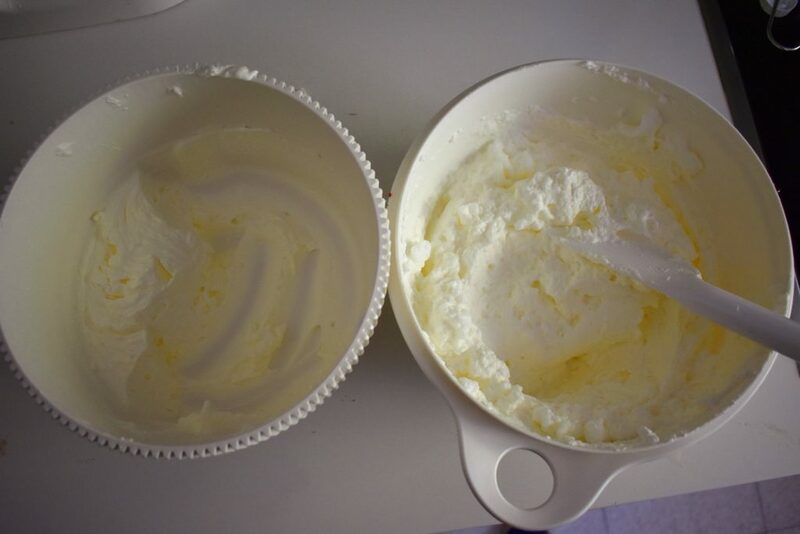 In case someone isn’t into sugar free recipes then there is always an option to pour ½ cup / 100g sugar into the cream instead of the sweetener and there we have the normal one instead of the low carb recipe version. Otherwise it’s a low carb ice cream that it’s even a suitable dessert for diabetics given that it’s consumed in moderation. 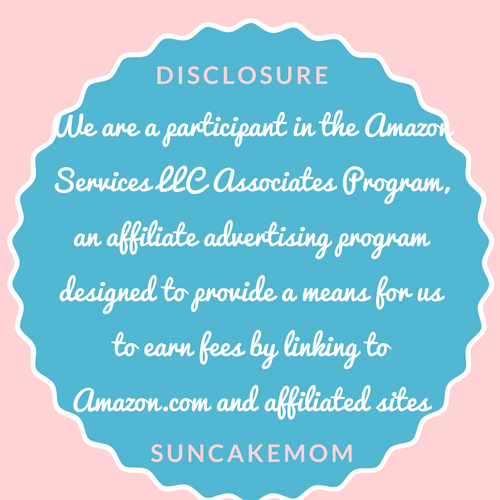 It’s an enormous success and one of the biggest accomplishment among the low carb desserts. Viennetta always tastes heavenly! 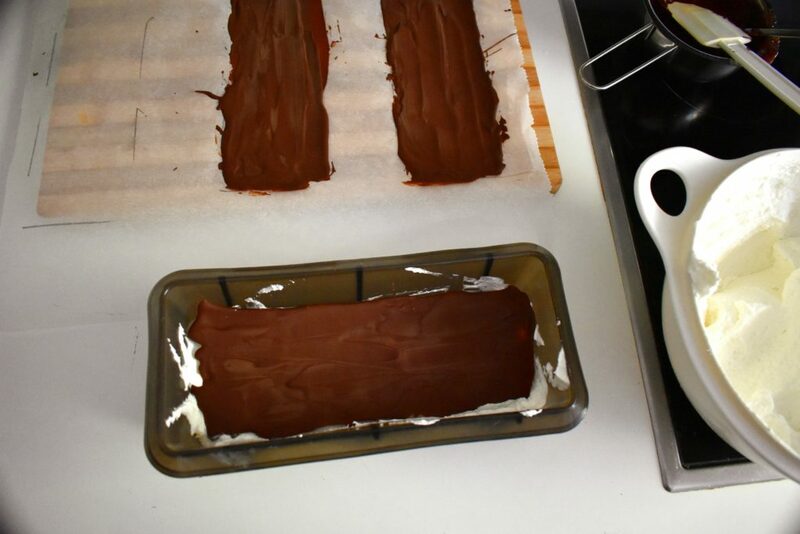 Start with melting 3.5 oz / 100g of chocolate as it needs the most time to prepare. 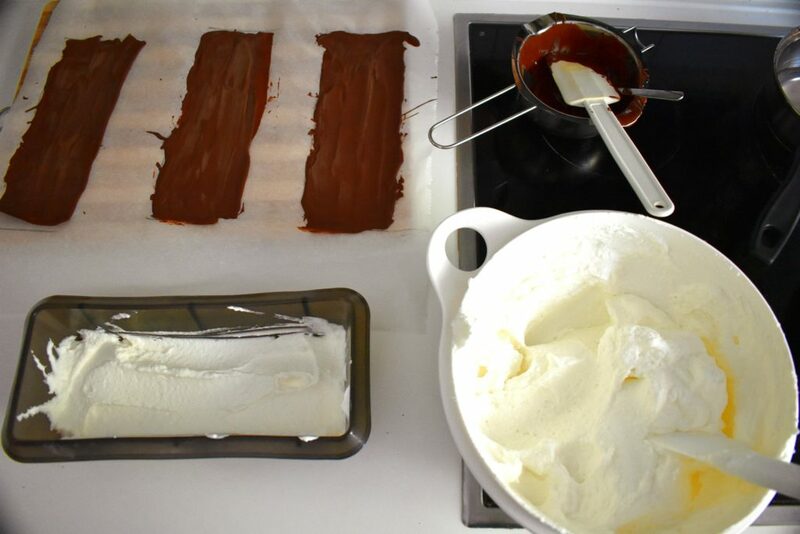 Break chocolate into pieces and put it into a small saucepan. 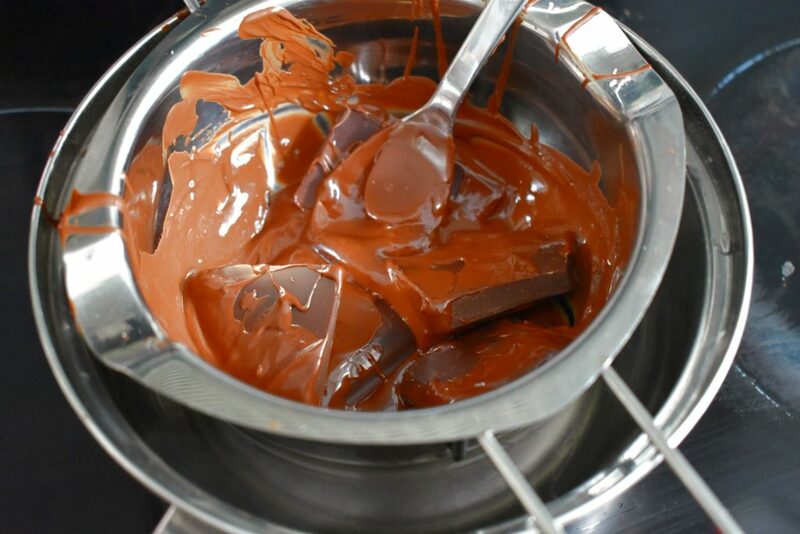 Place saucepan of chocolate on a slightly bigger saucepan of something water. Stir occasionally until melted completely. 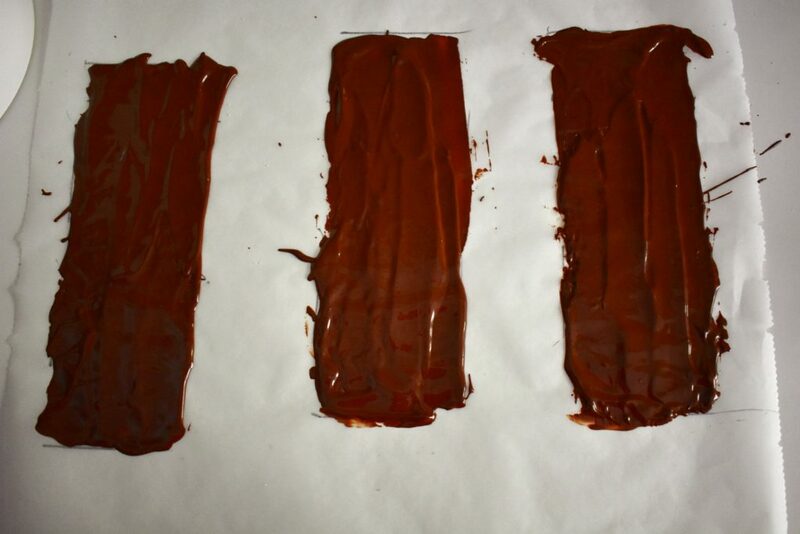 Whilst we are waiting for the chocolate to melt prepare the baking paper where we plan to spread chocolate. 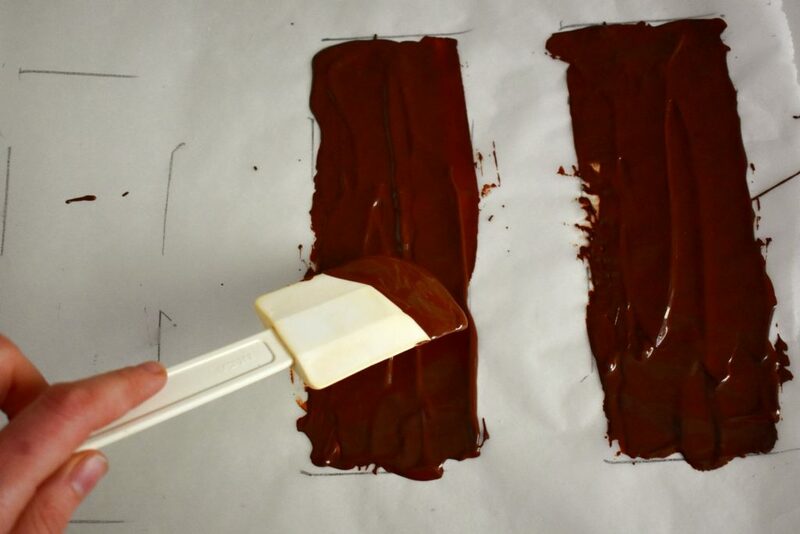 Make three thin rectangle sleets by spreading melted chocolate on the baking paper. The size of them has to be the same as the size of our baking tin. Put them in the in the fridge on a tray and continue with the next step. 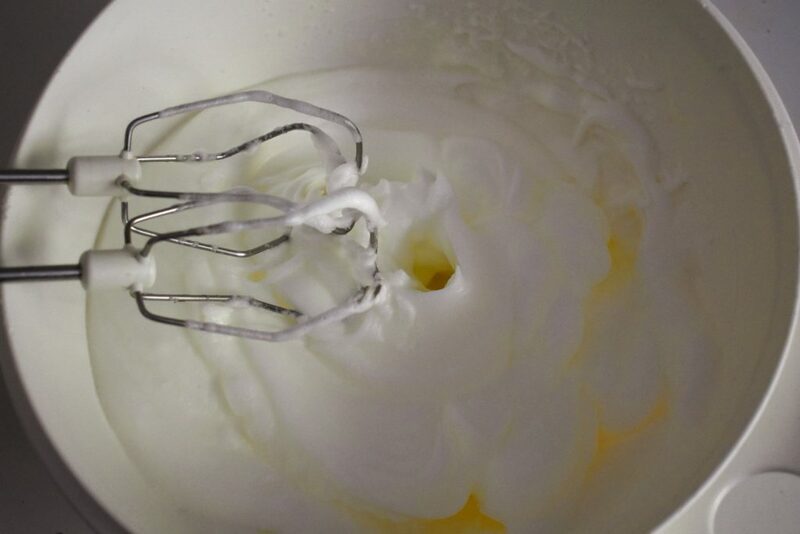 Gently stir whipped cream and egg whites until it incorporates well. In case of a tin baking form we need to cover the tin with cling film. 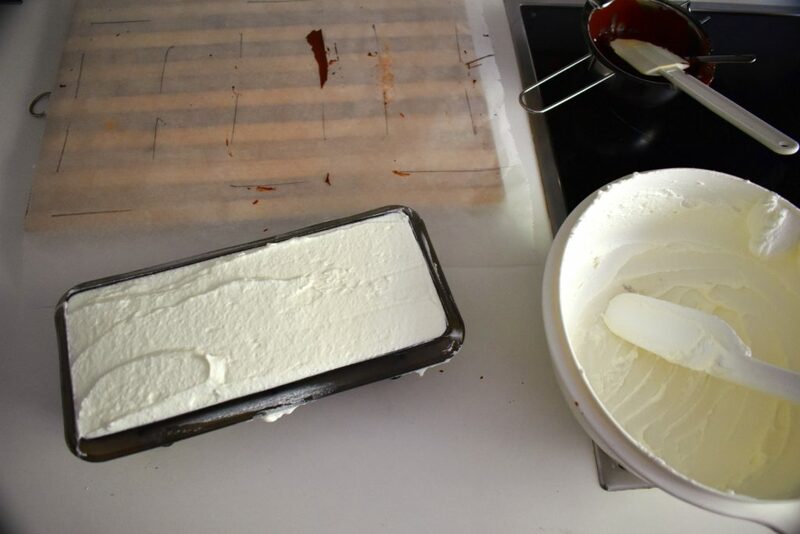 This step shouldn’t be missed as at the end it will help up take the ice cream or of the tin easily. Put some cream into the from. Then put the first chocolate sleet on top. 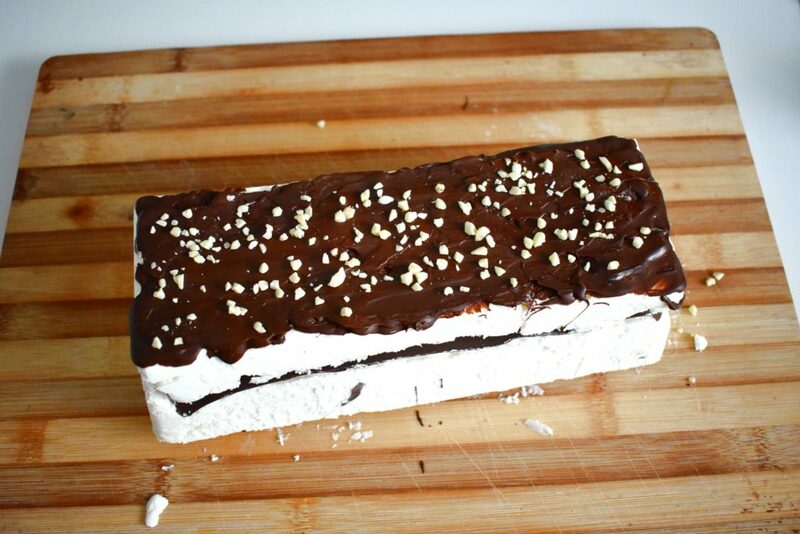 Slice and serve our very own homemade Viennetta ice cream. Enjoy! 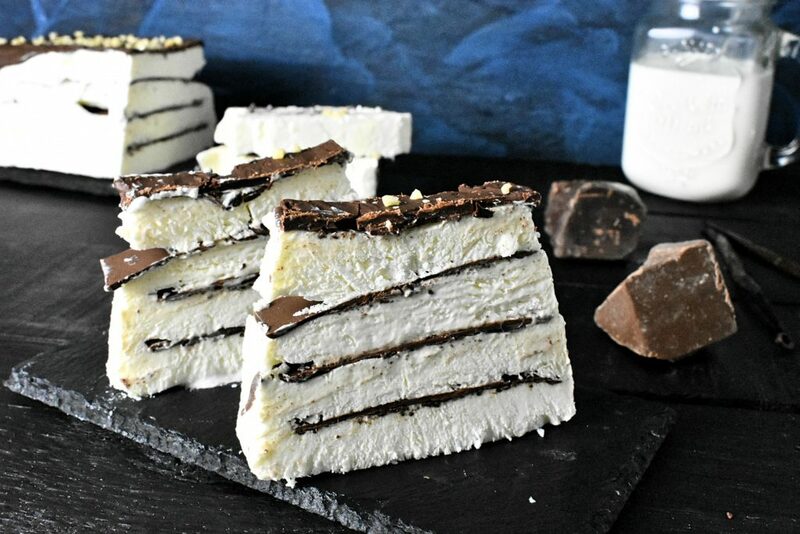 The 80's born Viennetta unites the smooth vanilla and the strong dark chocolate making it a timeless summer hit and a perfect companion for Dirty Dancing. 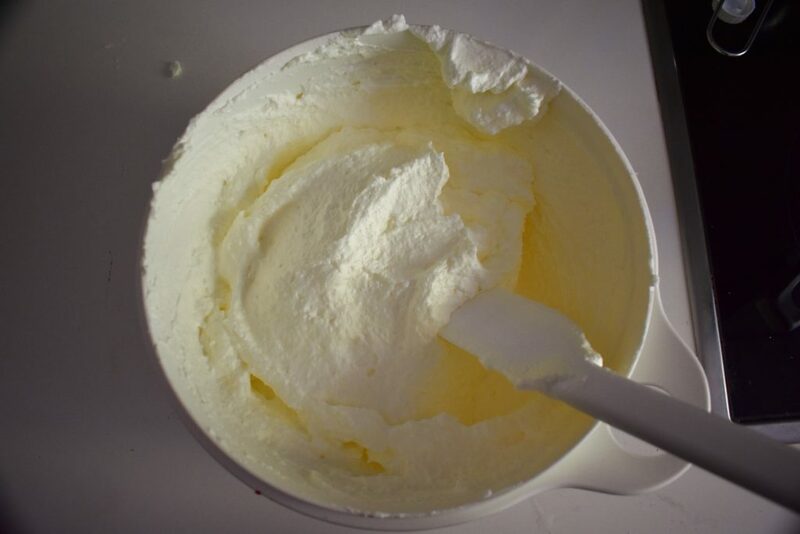 Put egg whites in a different bowl. Be careful not to have anything else in the bowl because if we leave any drop of yolk in, the egg whites won’t raise the same way. Whisk until it’s hard. 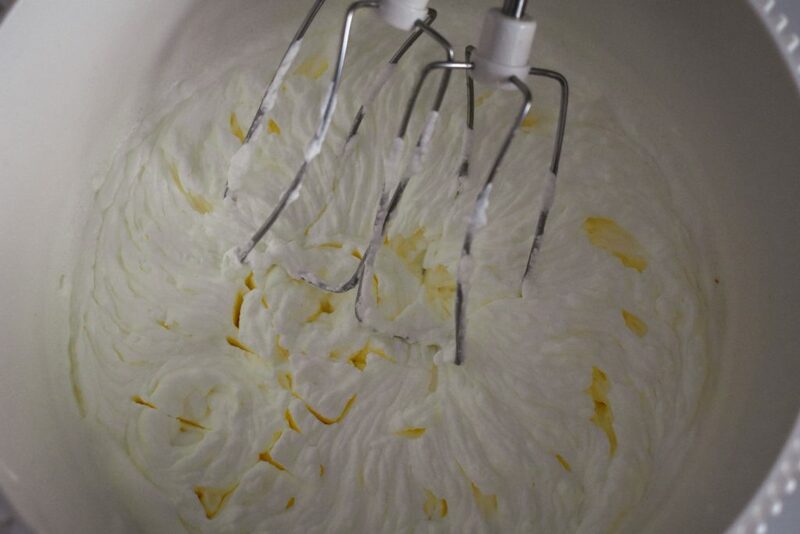 Gently stir whipped cream and egg whites until it incorporates well. Be careful not to break the foamy egg. We have to get an even mixture at the end. Cover the tin with cling film. 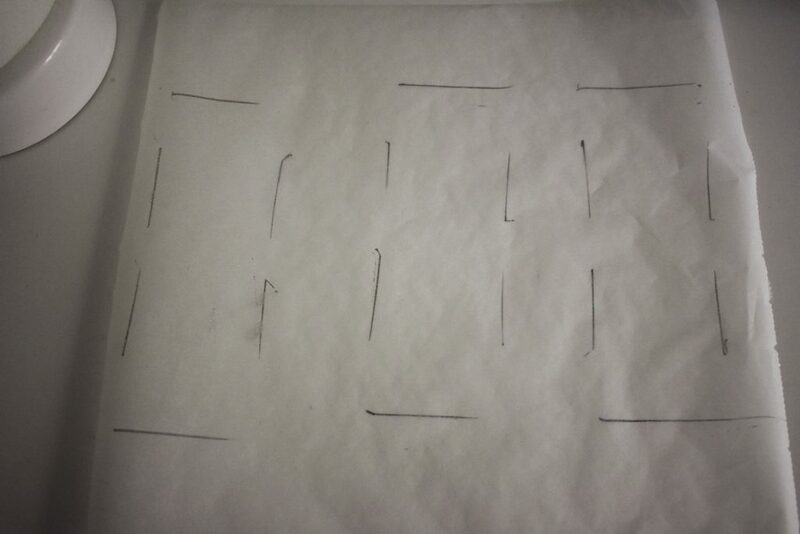 We shouldn’t miss this step as at the end it will help us take the ice cream or of the tin. 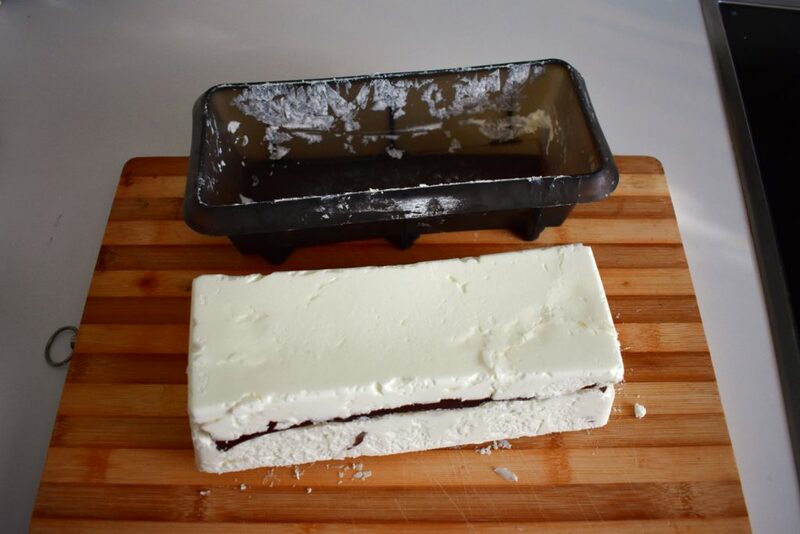 Slice and serve the homemade Vienetta ice cream. Enjoy! I really love that this has no sugar at all. Finally I can enjoy ice creams again! Happy to hear you’ve found joy in life again! Cool recipe. Thanks for sharing. Sharing is caring! Thanks for making it! 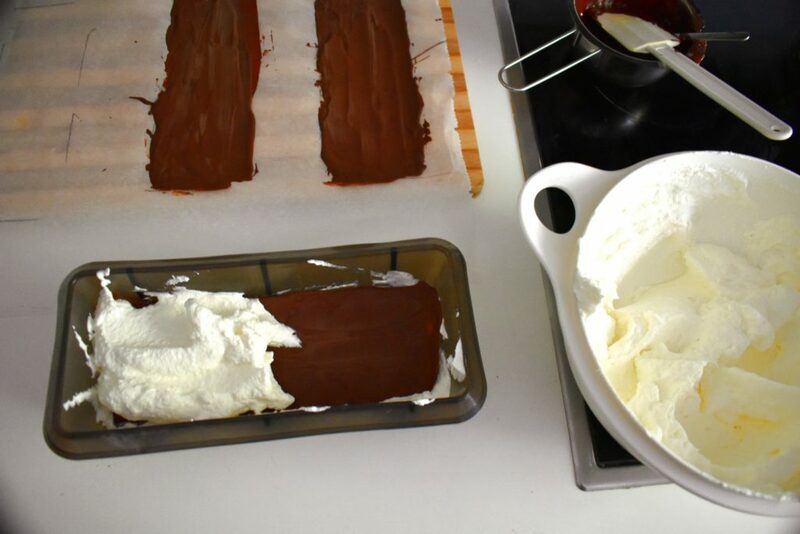 It’s easier to make than it seems and it doesn’t seem hard at all ;D Love Viennetta!